Sign up for quick, easy reminders from remind.com! Using remind.com is a fast, easy way to get reminders and updates from me via e-mail and text! Anytime registrations are due or deadlines are approaching, I can send a quick text or message to let you know. -Sign up for text messages by texting @smsgif to 81010. -To receive e-mail reminders, e-mail smsgif@mail.remind.com -- you can even leave the subject line blank. You'll be added to my address list, and you'll receive all of my quick reminders for Room 402! -Independent Study Projects include the writing of a research paper on students' chosen topics. Rough drafts of these papers are due on Oct. 19th (B day) and 20th (A day). With a shortened week this week, many students will need to work on finishing their drafts over the weekend. Check with your child to see what kind of progress he or she has made! -Tuesday is the KU Literature Festival I've been talking about for so long! Students who have registered for the festival must have read either Angry Management by Chris Crutcher or I Never Said I Wasn't Difficult by Sara Holbrook prior to attending. Students must be prepared to discuss the book they read as part of the day's activities. Please send your child with a sack lunch or money to purchase lunch at the KU student union since we will not be eating at school. The bus loads at 7:30, so please make arrangements to get your child to South prior to 7:30 if they do not usually arrive by then. We will return to school before the end of the day, so additional transportation arrangements will not need to be made. Students not attending the Lit Fest will go to their classes as usual, including my guided study if they are scheduled to. -If you haven't already, please be sure to fill out the Google permission form I e-mailed out a couple of weeks ago. This will give permission for your child to attend the KU Literature Festival. If you'd rather have a hard copy sent home to sign and return, please let me know, and I can accommodate! -Parent-teacher conferences will take place after school on Wednesday, Oct. 21st and from 8 a.m. to 7 p.m. Thursday, Oct. 22nd. I'll do my best to attend the conferences that I can, but please take a second to stop by room 402 to say hello if I don't catch you! -The student club, Women of Color and Brothers in Harmony, will be selling pizza by the slice and bottled water during parent-teacher conferences in the cafe area of the building from 5-7 p.m. each evening. Pizza will be $2/slice or two slices for $3. Bottled water is $1. Make an evening of it, and join us for parent-teacher conferences! -Model UN country preferences have been submitted by participating students, and I took them to Wednesday evening's sponsor meeting in Topeka. Room 402 will be representing the countries of Syria, Hungary, Uganda, Canada, and Germany! Our first Model UN meeting will be Tuesday, Oct. 20th after school until 4 p.m. We will likely continue to meet on Tuesdays after school, but we will discuss this as a group at our first meeting. -Chess Club continues to meet on Thursdays after school until 4 p.m.
-My largest 8th-grade class engaged in a debate day last week regarding whether or not women should fulfill combat roles in the U.S. military. Both sides of the argument were represented by teams of three, and each position had six minutes to present their argument. This was followed by 4-minute rebuttals and a debriefing session. Students did a great job of researching the issue and supporting their claims. We look forward to debate days every other Friday and the opportunity to explore a variety of issues! -Students will have the opportunity to attend a presentation by KU engineering students the morning of Oct. 29th in the South auditorium. Students will be excused from their Advisory class and 1st hour but will be responsible for any work they miss. I encourage all of my kids to participate -- it should be a great presentation! -Attention Parents of 8th-Grade Girls: KU's chapter of Society of Women Engineers is hosting the first-ever KU Women in STEM Day Saturday, Dec. 5th from 9 a.m. to 2 p.m. This is a FREE event for 8th-grade girls interested in science, technology, engineering, and math. The day's activities include hands-on challenges, question-and-answer sessions with KU students in STEM fields, and industry speakers and presenters. Lunch is even included! Students should plan to register ASAP as spots are limited, but the deadline is Nov. 13th. They can register by visiting https://engr.ku.edu/ku-women-stem-day. 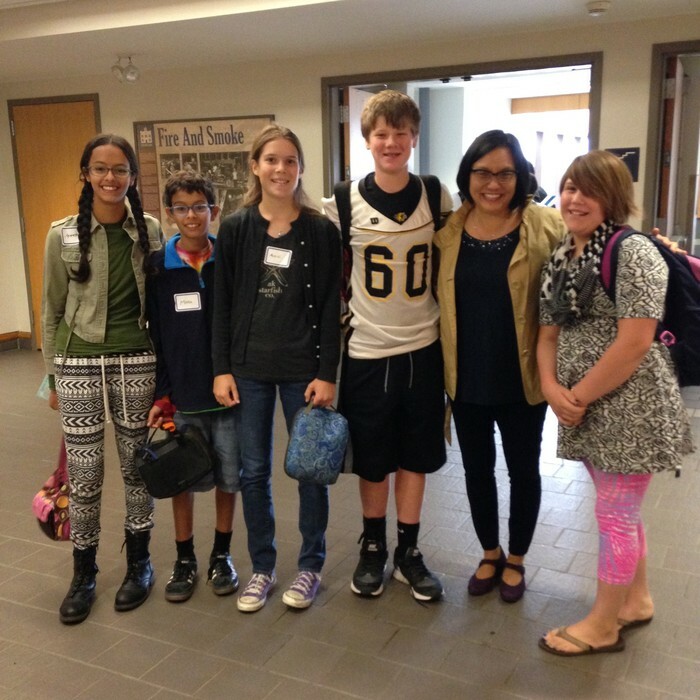 A few students from Room 402 accompanied Ms. Scotten, the school's librarian, to KU for the East Asian Literature Festival last week. What a great opportunity and experience!